October 18th marked the opening of the Los Angeles chapter of Polished Girlz. The opening party was a huge success, drawing in nail professionals and celebrities alike. Among those who attended were celebrity nail artist Naja Rickett, Brian Garces, Skye Townsend, and Kate Linder. 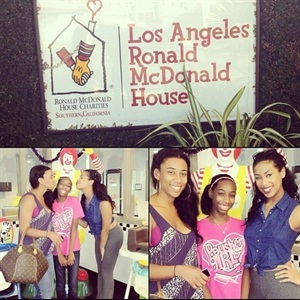 The following day, Polished Girlz was able to polish at the Ronald McDonald House in Los Angeles in a partnership with 7 For All Mankind. The event was sponsored by Orly, who provided all the color and glitter any girl could ever dream of. At the moment, Alanna’s favorite polish is one of those sparklies, aptly named “Be Brave.” It’s a pink color with a cancer awareness charm. Recently Alanna painted the nails of a little girl who was diagnosed with a rare bone cancer with that color. Being brave and polished is what Alanna’s mission is all about. Polished Girlz serves organizations that take care of children with special needs including hospitals, support groups, Ronald McDonald Houses, Muscular Dystrophy Association, Sickle Cell Association, Down Syndrome Association, Mended Little Hearts, as well as serving clients in the privacy of their homes. “The best part about volunteering is not only getting to make others feel good but getting to make new friends. I feel like it’s not work if it is something that you love to do and what I have learned the most is that you are never too young to serve,” says Alanna. Alanna not only serves clients in need of some pampering, but she also gets an important message out about sanitation. Hand washing and infection reduction can save lives, and that message is not only aimed at clients, but at volunteers, parents, nurses, and everyone else who gets excited about nails as much as the Polished Girlz do.